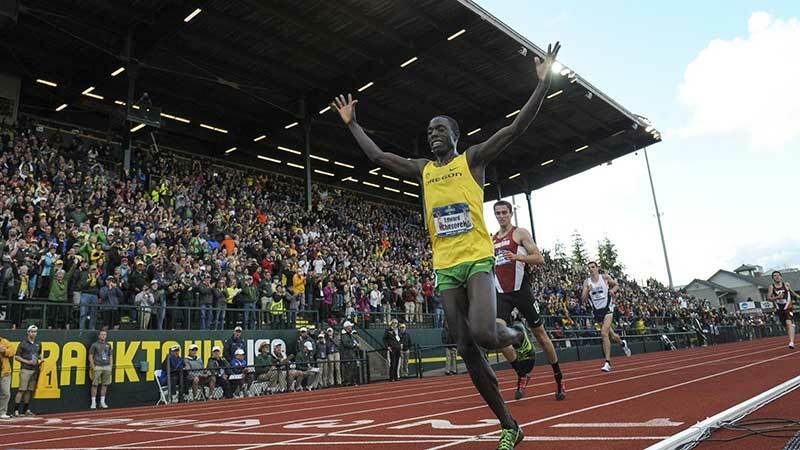 Hayward Field has been the home of legends since its inception. Named for one of track and field’s most innovative early coaches, by the time the first grandstand was built in 1925, the University of Oregon had already produced two All-Americans and won a Pacific Coast Conference title. Every passing season has brought changes, but the two constants have been excellence and accolades. More USA Olympic Track and Field Trials and NCAA Outdoor Track and Field Championships hosted than any other venue; more “World’s Greatest Athlete” titles bestowed upon decathlon world record breakers than at any other venue; and more incredible performances than you could name in the time it took Pre to run a mile. Hayward Field was constructed as a football stadium. It had previously been a cow pasture when the university kept cattle to supply milk to the dormitory students. A creek ran through this lot creating problems when the university moved the athletic field from Kincaid Field to this new location. Three feet of rock and coarse gravel had to be laid down, and then 12 to 15 inches of sandy soil on top. 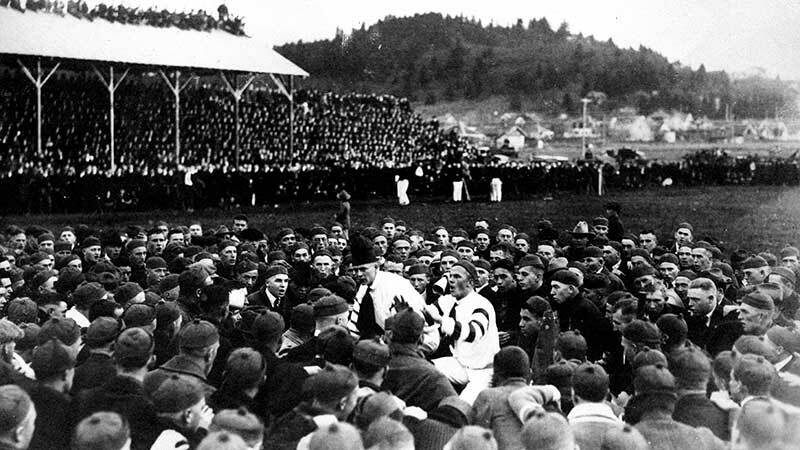 Two UO yell kings in the middle of a throng of students at Hayward Field on November 15, 1919, prior to a football game against Oregon Agricultural College—the first game ever played at Hayward Field. The father of Oregon track and field and its famous track and field facility, Bill Hayward was appropriately known as the ‘Grand Old Man’ during his 44-year career as a Duck coach from 1904-1947. In addition to his track and field coaching duties, Hayward also served as athletic trainer and basketball coach. He coached four track world record holders, six American record holders, and nine Olympians, and assisted on U.S. Olympic teams from 1908-1932. 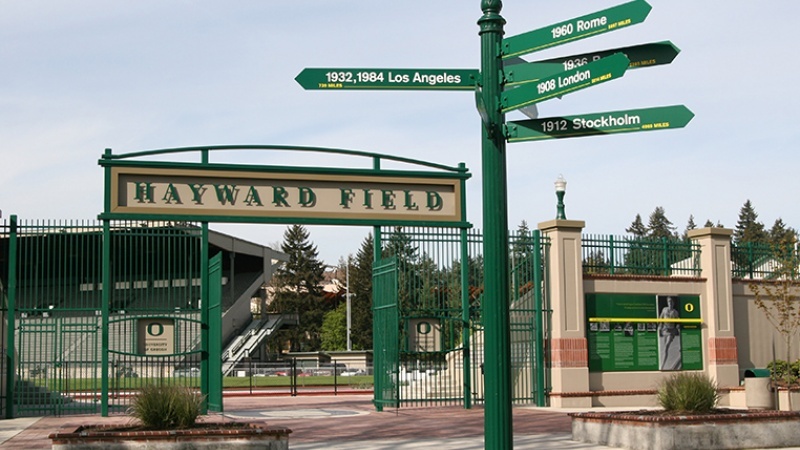 Bill Hayward didn't know that Hayward Field had been named in his honor until the day after the dedication because the ceremony was held during halftime of the first football game while Hayward was in the locker room serving as the football team's trainer. 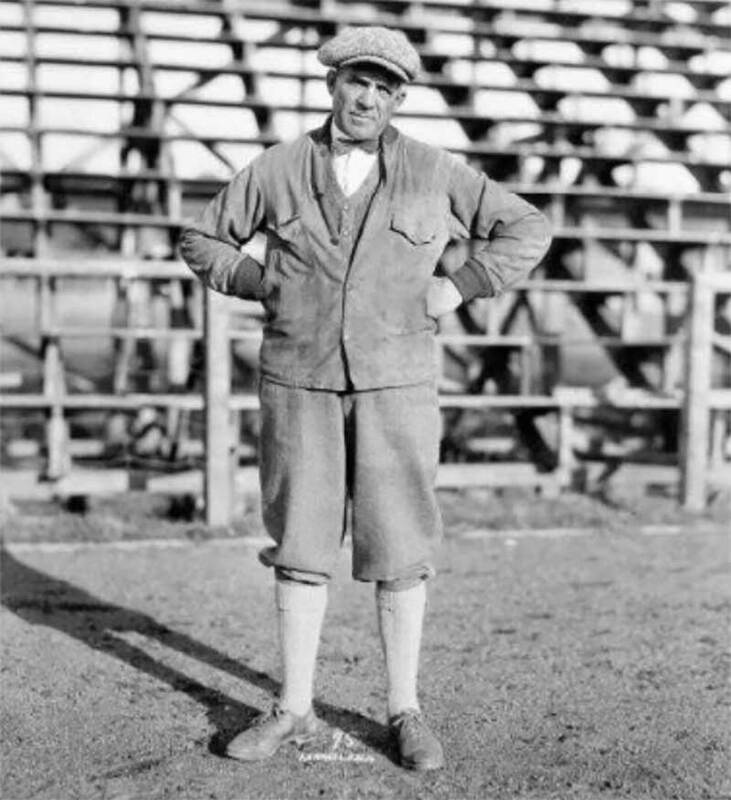 University of Oregon track coach Bill Hayward standing in front of the bleachers at Hayward Field in 1926. The track, bordering the football playing field, was installed for $10,000, and included a 220-yard straightway on the east end. The bleachers were transferred from Kincaid Field, where the University of Oregon's track and field team previously competed. Men working at Hayward to install the new cinder track. 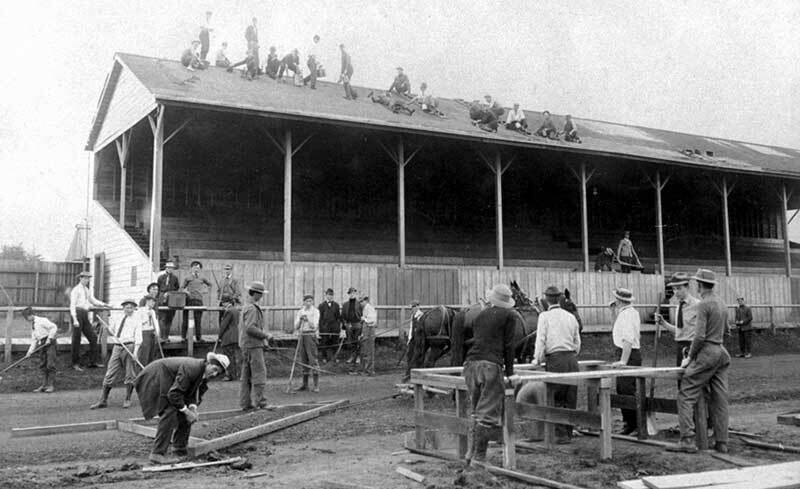 University of Oregon students paid to cover the bleachers on the northeast end that remained until 1950. 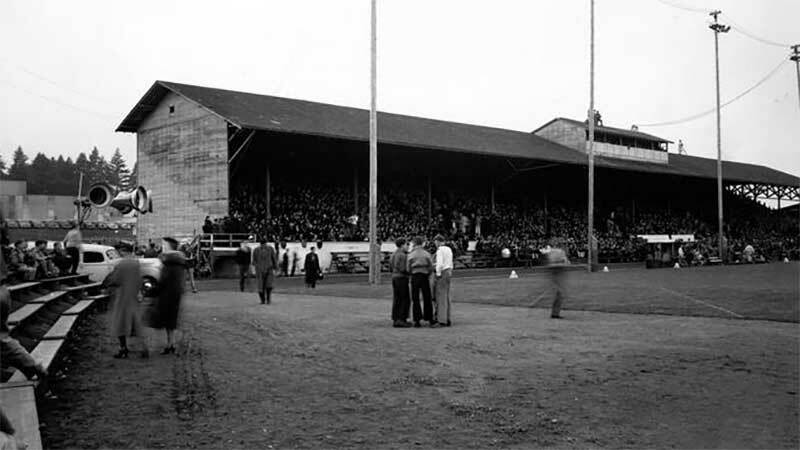 Homecoming football game played against Oregon State at Hayward Field on October 23, 1937. Renovation to Hayward Field added 2,240 permanent seats in the south endzone, with 2,576 removable seats added in the southeast and southwest corners of the endzone, giving the stadium a capacity of 22,500 for football games. 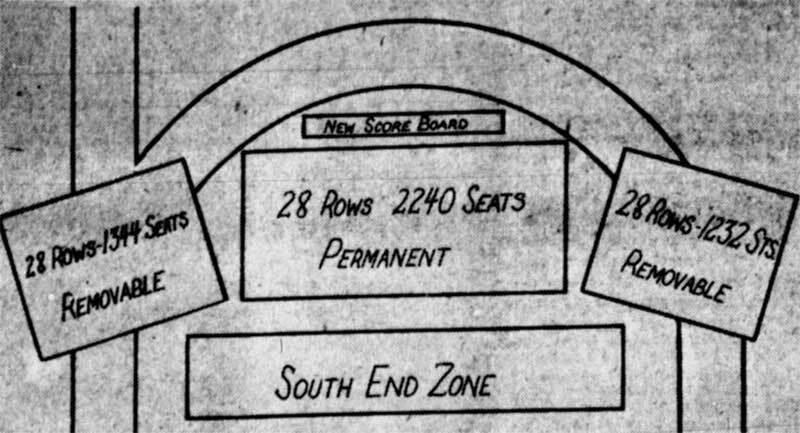 Illustration of the new 1949 addition at Hayward Field from the July 21, 1949, issue of the Eugene Register-Guard. The new scoreboard was erected just behind the new permanent seats in the south endzone. It listed score, down, yards to go, and total first downs and was operated from the press box. It also had a clock that was operated from the east side of the field. 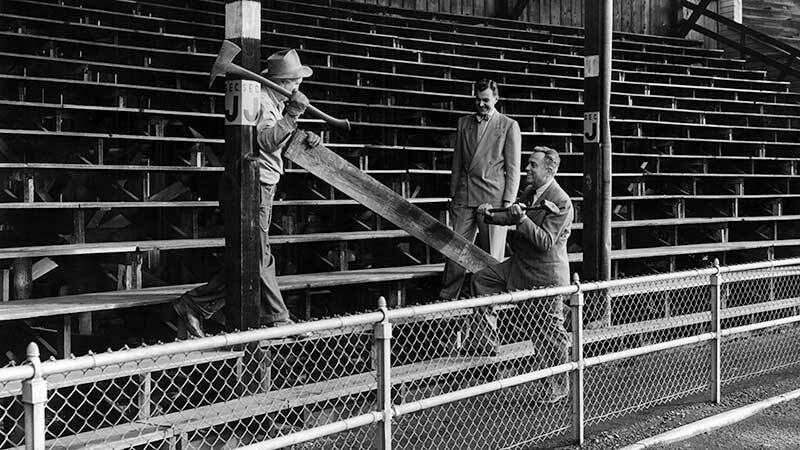 University of Oregon athletic director Leo Harris (holding the sledge hammer) and two men pose for a commemorative shot as work to remove the north bleachers at Hayward Field is set to begin in 1950. 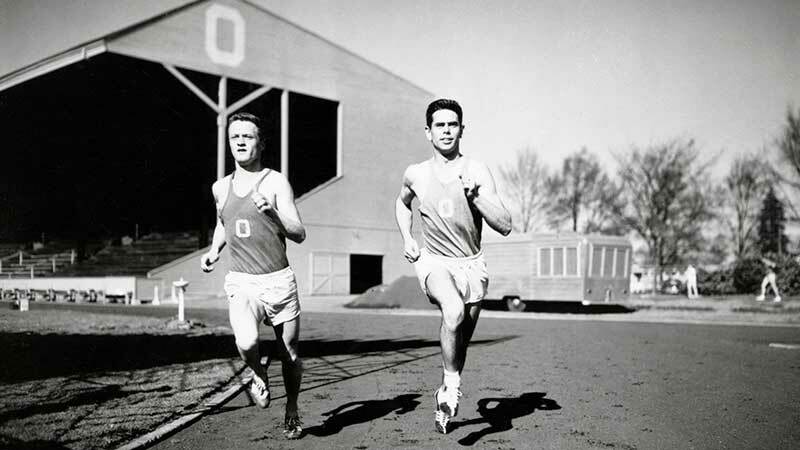 Distance runners Bill Dellinger (left) and Jim Bailey running at Hayward Field during a 1955 practice, one year before both became All-Americans in 1956. The Men of Oregon won their first NCAA Championship with 85 points as Hayward Field hosted the event for the first time. It was also the first NCAA Championship for legendary Oregon head coach Bill Bowerman. 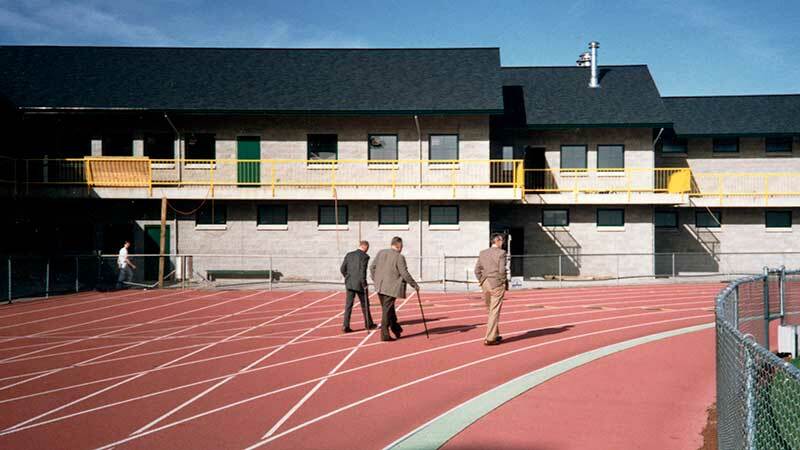 The east grandstand at Hayward Field, taken during a late 1960s meet. The Men of Oregon won their second NCAA Championship, and their second NCAA Championship at Hayward Field, with 70 points. It was also the second NCAA Championship for Bowerman. The Ducks football team's last game in Hayward Field was against Washington State on November 5, 1966. Video footage from the final football game at Hayward Field played against Washington State on November 5, 1966. 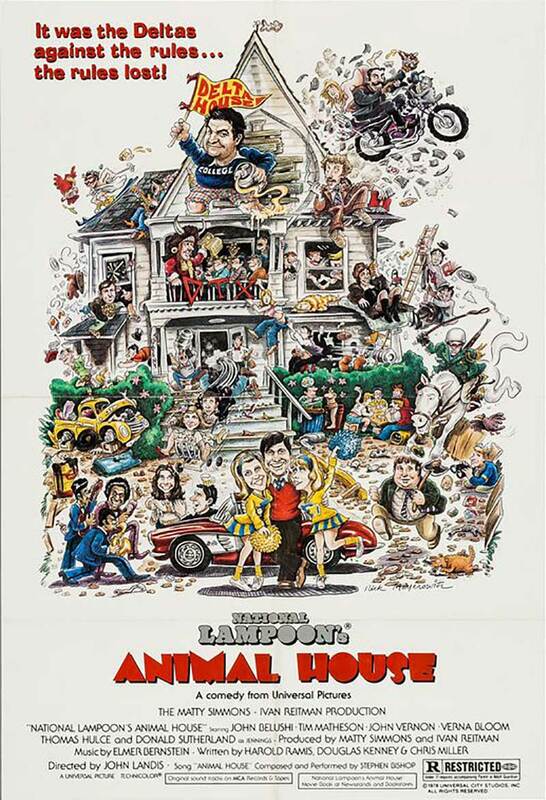 Video courtesy of the Washington State University Libraries. The Men of Oregon won their fourth conference championship, and the first at Hayward Field. The first all-weather urethane surface was installed to replace the cinders, and the track was named Stevenson Track. After having only 6 lanes since 1921, the track was expanded to have 8 lanes. 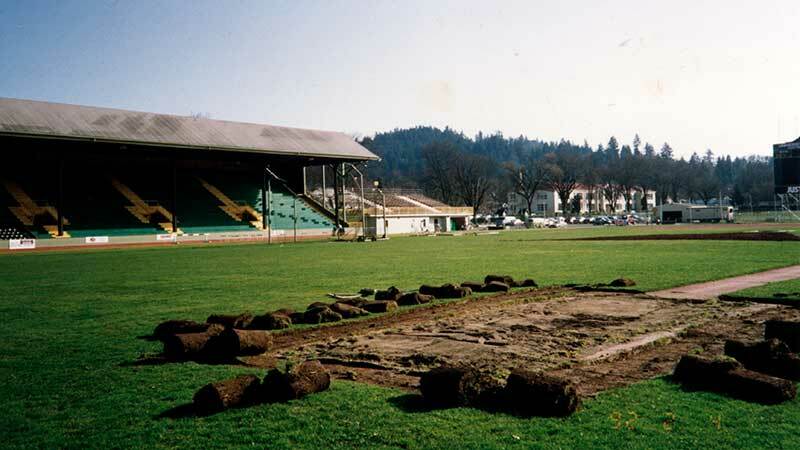 The northwest jumping pit surrounded by rolls of sod during a renovation at Hayward Field around 1970. 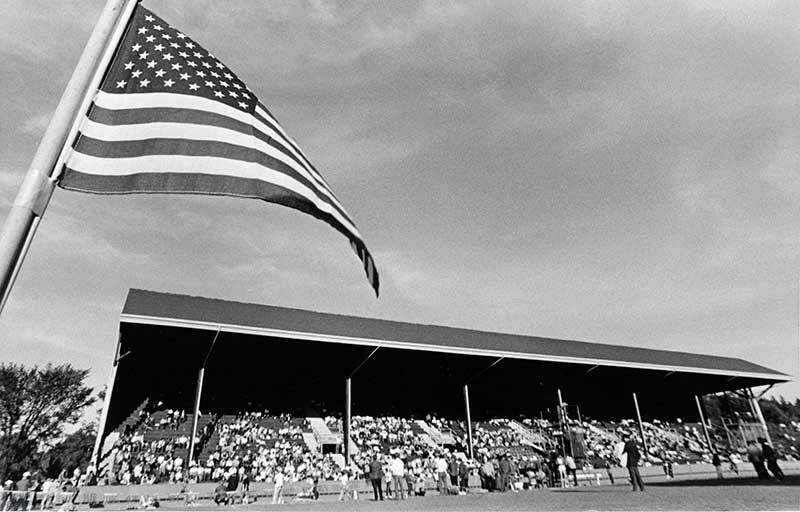 Hayward Field hosted the US Olympic Trails for the first time, which saw three Men of Oregon advance to the Olympic Games in Munich, including Steve Prefontaine. Hayward Field hosted the NCAA Championships for the third time. UCLA took home the title, while Oregon finished in fourth place. 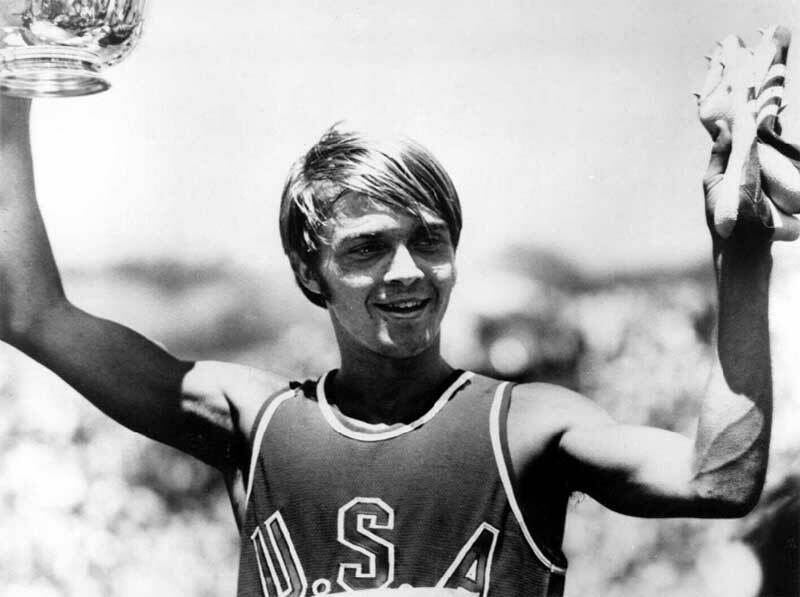 Steve Prefontaine representing the United States at a dual All-Star meet against the Soviet Union in July 1971. Hayward Field hosted the conference championships for the second time as USC took home the title and Oregon finished in third. 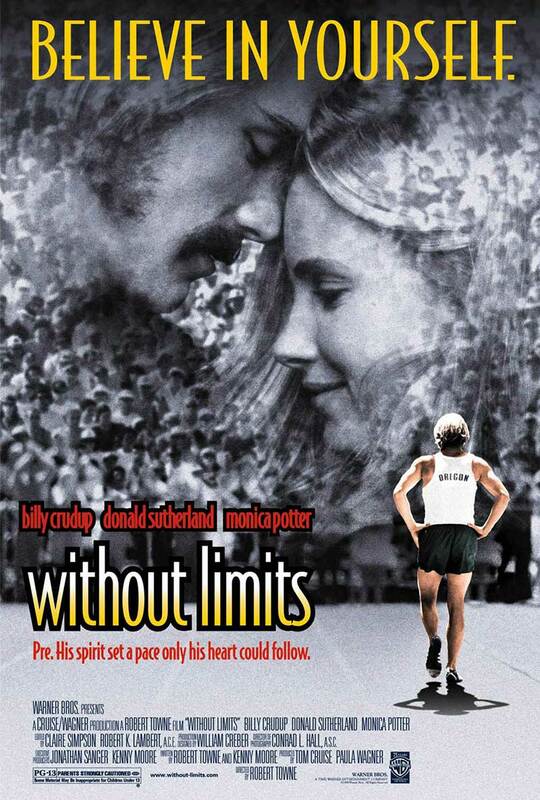 The restoration project rebuilt the west grandstand to its current layout and received substantial support from gifts and a special fundraising track meet in which Steve Prefontaine ran. 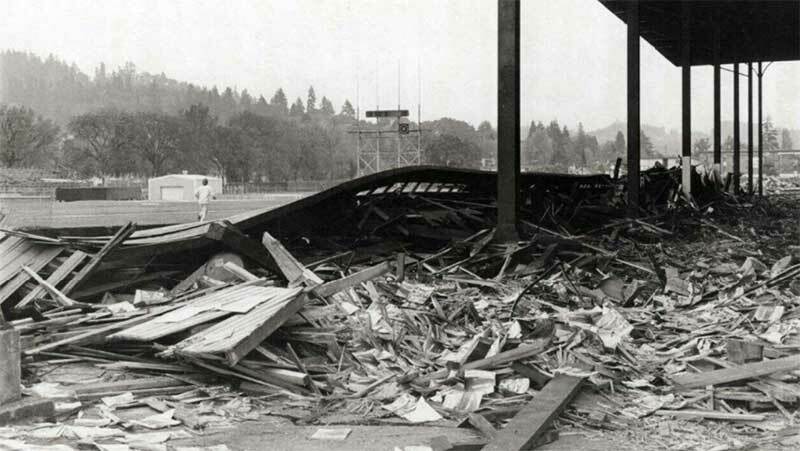 The gutted west grandstand at Hayward Field during the 1975 renovation. Tom Heinonen joins the Oregon coaching staff as a graduate assistant, eventually becoming the women's head cross country and track and field coach. 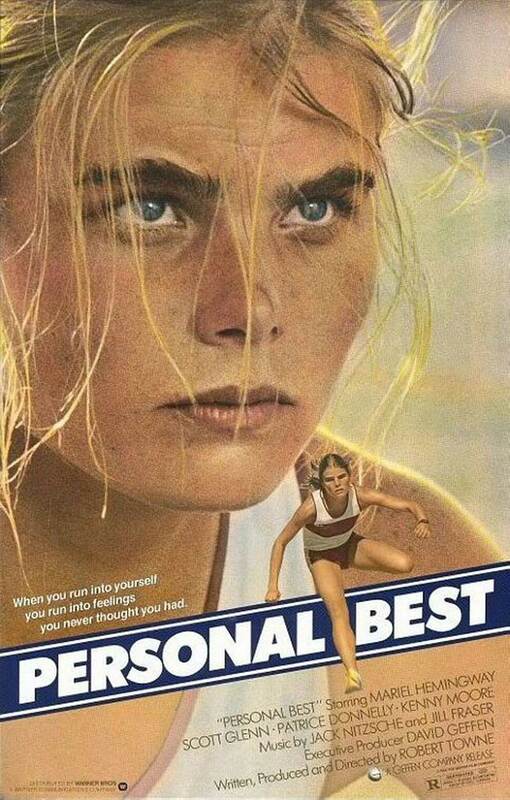 Instrumental in the development of women’s athletics at Oregon, Heinonen inspired and led 134 All-Americans, ten Olympians, ten Academic All-Americans, and 14 individual national title winners in a 28-year career. Hayward Field hosted the US Olympic Trails for the second-straight time, which saw two women and six men, including Matt Centrowitz, advance to the Olympic Games in Montreal. Hayward Field hosted the NCAA Championships for the fourth time as UCLA and Texas-El Paso tied for the title and Oregon finished in fourth place. 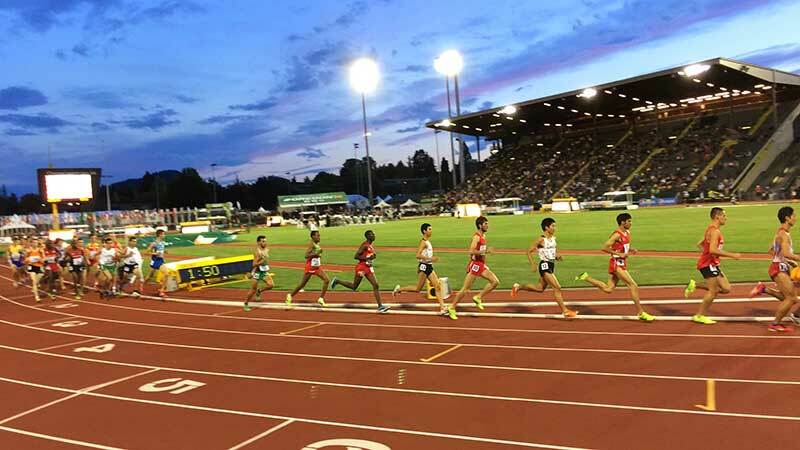 Hayward Field hosted the US Olympic Trails for the third-straight time, which saw seven men, including Alberto Salazar, qualify for the Olympic Games in Moscow. However, the United States boycotted the 1980 Olympics so those athletes did not compete. Hayward Field hosted the conference championships for the third time as UCLA took home the title and Oregon finished in fourth. Hayward Field hosted the NCAA Championships for the fifth time as the Men of Oregon won their fifth national title overall and first for head coach Bill Dellinger while the Women of Oregon finished fourth. 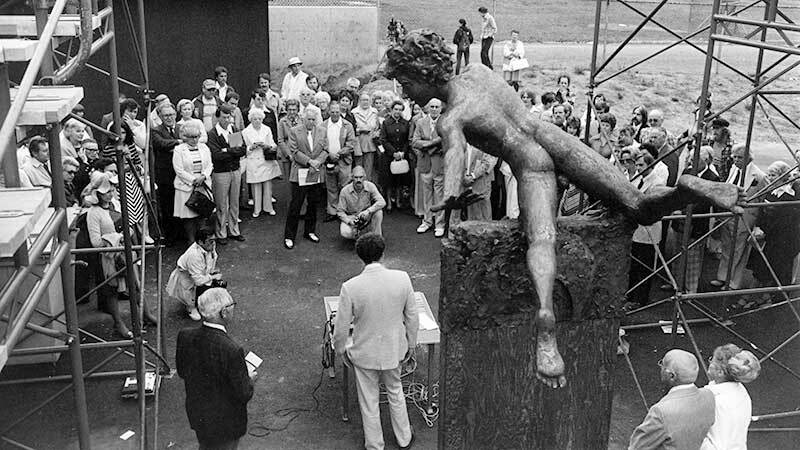 Press conference announcing the renovation of Hayward Field in April 1987. University President Paul Olum is at lower left facing away from the camera. Hayward Field hosted the NCAA Championships for the sixth time as the Men of Oregon finished tied for seventh while the Women of Oregon finished third as Annette Hand claimed the 5,000-meter title and Jill Smith won the javelin championship. Hayward Field hosted the NCAA Championships for the seventh time as the Men of Oregon finished third while the Women of Oregon finished tied for 15th. Situated on the northwest corner of the facility, the $2 million building was dedicated to Bill Bowerman and his family, who donated funds necessary to construct the all-purpose building. The two-story, 15,000-square-foot brick building houses the Bowerman Sports Science Clinic along with athletic treatment, locker rooms, and meeting rooms. Memorabilia and various exhibits commemorate great athletes, teams and moments of the program's history. Former Ducks track coach Bill Bowerman and two other men walking on the Hayward Field track towards the Bowerman Building. 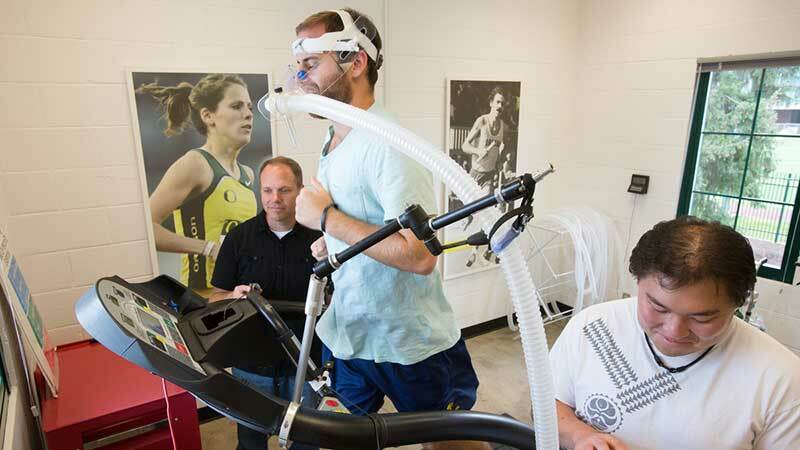 Bowerman Sports Science Clinic Director Michael Hahn (far left) performing a VO2 Max Test in the Bowerman Family Building. Hayward Field hosted the conference championships for the fourth time as UCLA took home the men's title and the Men of Oregon finished in second, while the Women of Oregon won their second-straight conference championship. Sprinter Camara Jones winning the 400 meters during the Pac-10 Conference championships at Hayward Field in 1992. Hayward Field hosted the USA Championships for the first time as Michael Johnson broke the championship record on his way to the men's 400-meter title and Lynn Jennings broke the 10,000-meter championship record to take home the championship. Hayward Field hosted the NCAA Championships for the eighth time as the Men of Oregon finished 30th while the Women of Oregon finished fifth. Hayward Field hosted the USA Championships for the second time as Regina Jacobs won both the 1,500-meter and the 5,000-meter women's titles and Michelle Rohl set a new American record to win the 20 km walk. 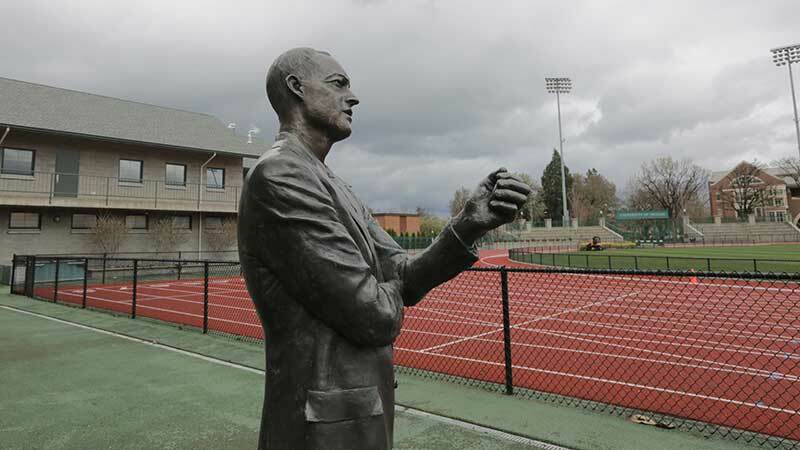 The Bill Bowerman statue was added next to the Bowerman Family Building in the northwest corner of the stadium on the "Bowerman Curve." It was sculpted by Nike employee Diana Lee Jackson. Hayward Field hosted the conference championships for the fifth time as USC took home the men's title and the Men of Oregon finished in seventh, while UCLA claimed the women's title and the Women of Oregon finished ninth. 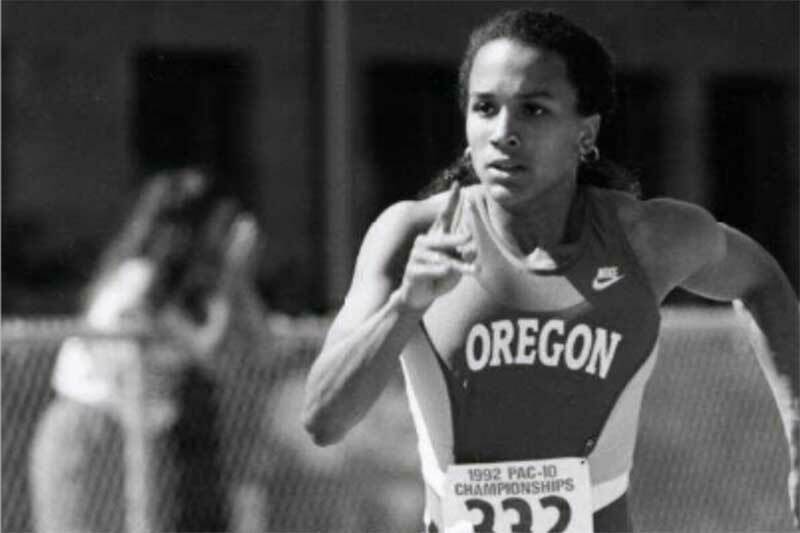 Hayward Field hosted the USA Championships for the second time as Regina Jacobs won both the 800-meter and 1,500-meter women's titles. Hayward Field hosted the NCAA Championships for the ninth time as the Men of Oregon finished ninth. Santiago Lorenzo claimed the decathlon title and John Stiegleler won the javelin. The Women of Oregon finished tied for 60th. 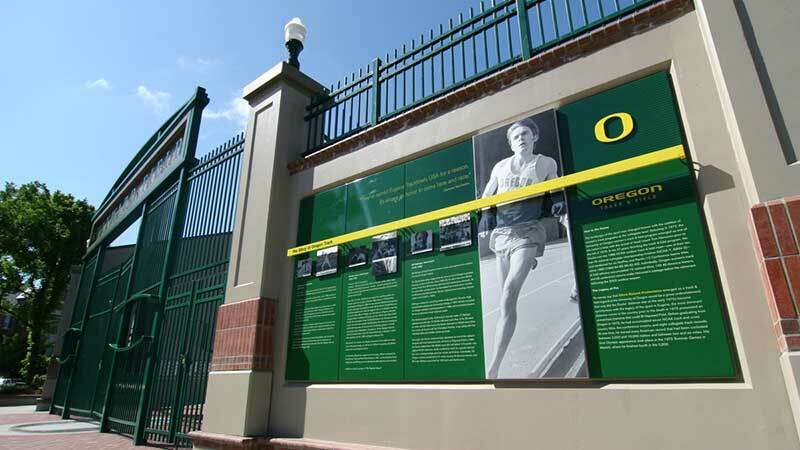 Powell Plaza was unveiled to welcome fans into the northeast entrance of the fabled facility and provide details of the UO's rich track and field heritage. It is named after the family of Lloyd Powell, a track teammate of former coach and athlete Bill Dellinger. A complete facelift of the indoor practice area under the west grandstands was finished and included a new urethane-coated competition surface, jump runways and pits, and several throwing rings. A pair of state-of-the-art underwater and anti-gravity treadmills were installed to enhance Oregon's national-class athletic treatment facilities. In addition, a new four-lane, fully-lit 400-meter all-weather track was added that encircles six new tennis courts on the southwest edge of the track. 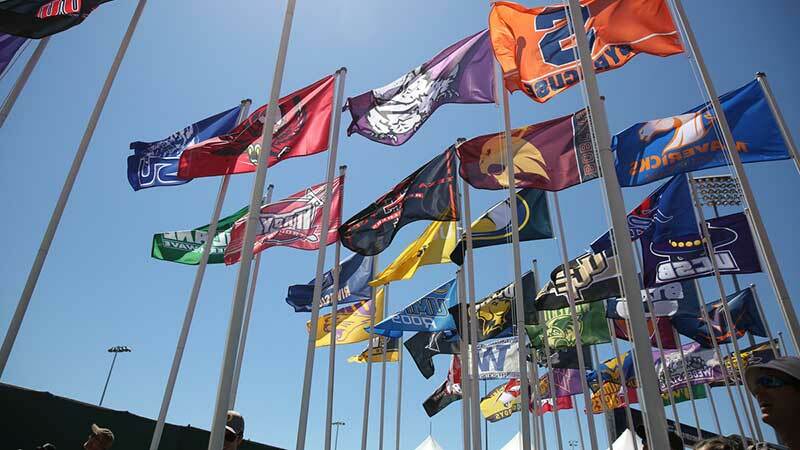 Hayward Field hosted the conference championships for the sixth time as USC took home the men's title and the Men of Oregon finished in second, while Arizona State claimed the women's title and the Women of Oregon finished fifth. 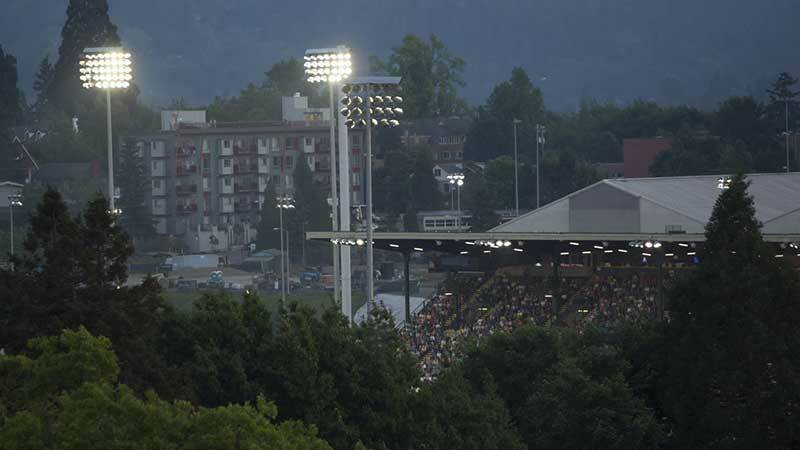 New permanent lighting system was unveiled to easily accommodate the most televised hours of Olympic Trials coverage, thanks to eight, 110-foot light poles and an additional lighting system fixed to the top of west and east grandstands. 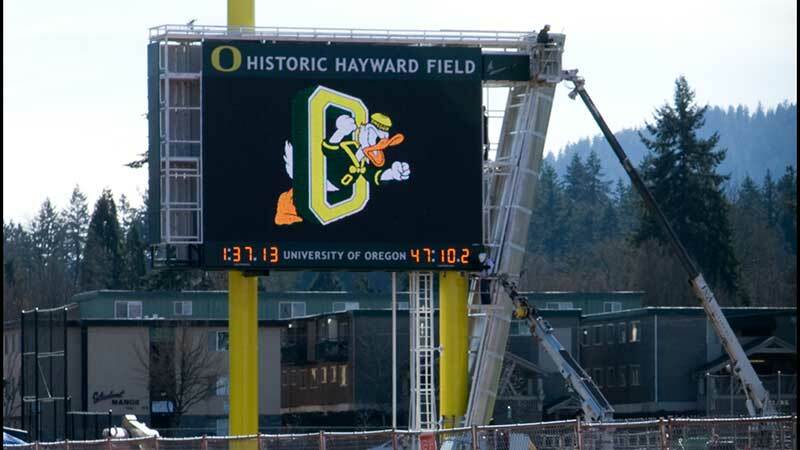 A new scoreboard was added, designed by noted Nike designer and University of Oregon graduate Tinker Hatfield. Hayward Field hosted the US Olympic Trails for the fourth time, which saw two men qualify for the Olympic Games in Beijing—Galen Rupp in the 10,000 meters and Andrew Wheating in the 800 meters. Hayward Field hosted the USA Championships for the third time as former Duck Galen Rupp won the men's 10,000 meters. Hayward Field hosted the conference championships for the seventh time as both the Men of Oregon and the Women of Oregon took home the conference title, the 13th conference title overall and third straight for the men and sixth overall for the women. Hayward Field hosted the NCAA Championships for the 10th time as the Men of Oregon finished third as Andrew Wheating won both the 800 meters and the 1,500 meters and Ashton Eaton won the decathlon, while the Women of Oregon finished second with Brianne Thiesen winning the heptathlon. Hayward Field hosted the USA Championships for the fourth time as former Duck Galen Rupp won the men's 10,000 meters, Matthew Centrowitz Jr. won the men's 1,500 meters, and Ashton Eaton won the decathlon. Hayward Field hosted the US Olympic Trails for the fifth time overall and second-straight, which saw five men qualify in six disciplines for the Olympic Games in London—Ashton Eaton set the world record in the decathlon and Galen Rupp won both the 5,000 meters and the 10,000 meters—and three women qualify, including Becky Holliday who finished second in the pole vault. Hayward Field hosted the conference championships for the eighth time as both the Men of Oregon and the Women of Oregon took home the conference title, the 16th conference title overall and sixth straight for the men and ninth overall and third straight for the women. Hayward Field hosted the NCAA Championships for the 11th time as the Men of Oregon finished fourth as Elijah Grer won the 800 meters and Mac Fleet won the 1,500 meters, while the Women of Oregon finished third with English Gardner winning the 100 meters. 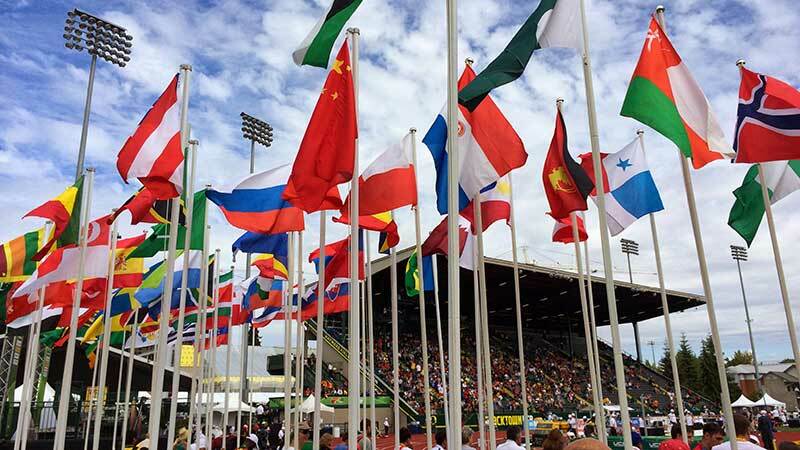 Hayward Field hosted the IAAF World Junior Championships for the first time. The meet saw some of the world's best up-and-coming athletes compete in Eugene, including Trayvon Bromell, Dina Asher-Smith, Mary Cain, Shamier Little, and Margaret Wambui. Hayward Field hosted the NCAA Championships for the 12th time as the Men of Oregon won their sixth title highlighted by Edward Cheserek winning the 10,000 meters, Devon Allen winning the 110-meter hurdles, Mac Fleet winning the 1,500 meters and Sam Crouser taking home the title in the javelin, while the Women of Oregon finished third as Laura Roesler won the 800 meters and Jenna Prandini won the long jump. Hayward Field hosted the USA Championships for the fifth time as former Duck Galen Rupp won the men's 10,000 meters, Matthew Centrowitz Jr. won the men's 1,500 meters, and Jenna Prandini won the women's 200 meters. Hayward Field hosted the NCAA Championships for the 13th time as the Men of Oregon won their seventh overall title and second straight as Edward Cheserek swept the 5,000 and 10,000 meters and Sam Crouser won the javelin, while the Women of Oregon won their second championship as Jenna Prandini won the 100 meters and Raevyn Rogers won the 800-meter title. Hayward Field hosted the US Olympic Trails for the sixth time overall and third-straight, which saw seven men qualify in eight disciplines for the Olympic Games in London, including Ashton Eaton, who won the decathlon; Galen Rupp, who won the 10,000 meters; Matthew Centrowitz Jr., who won the 1,500 meters; and Devon Allen, who won the 110-meter hurdles; and Cyrus Hostetler who won the javelin; and four women qualify, including English Gardner, who won the 100 meters. 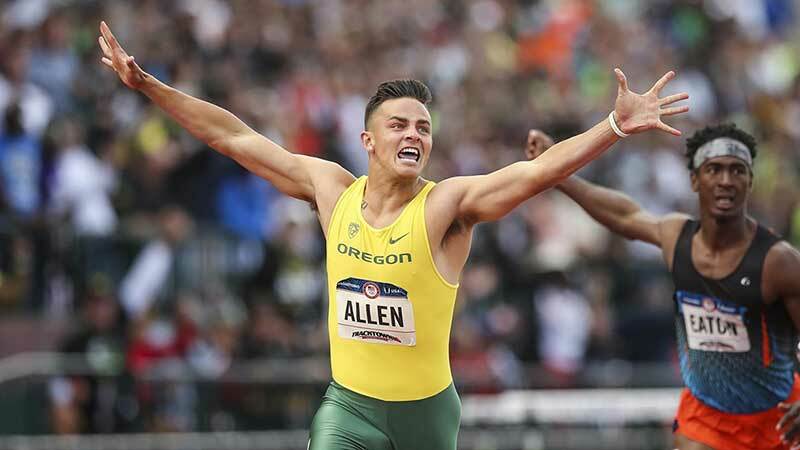 Devon Allen winning the 110-meter hurdles at the 2016 Olympic Trials. Hayward Field hosted the NCAA Championships for the 14th time as the Men of Oregon finished fourth as Edward Cheserek swept the 5,000 and 10,000 meters and Devon Allen won the 110-meter hurdles, while the Women of Oregon finished second as Ariana Washington swept the 100 and 200 meters and Raevyn Rogers won the 800 meters. Hayward Field hosted the NCAA Championships for the 15th time as the Men of Oregon finished in ninth place, while the Women of Oregon won their third national championship as Raevyn Rogers won the 800 meters. Raevyn Rogers won the 800 meters at the 2015, 2016, and 2017 NCAA Championships. Hayward Field hosted the conference championships for the ninth time as both the Men of Oregon and the Women of Oregon took home the conference title, the 21st conference title overall and 11th straight for the men and 14th overall and eighth straight for the women.